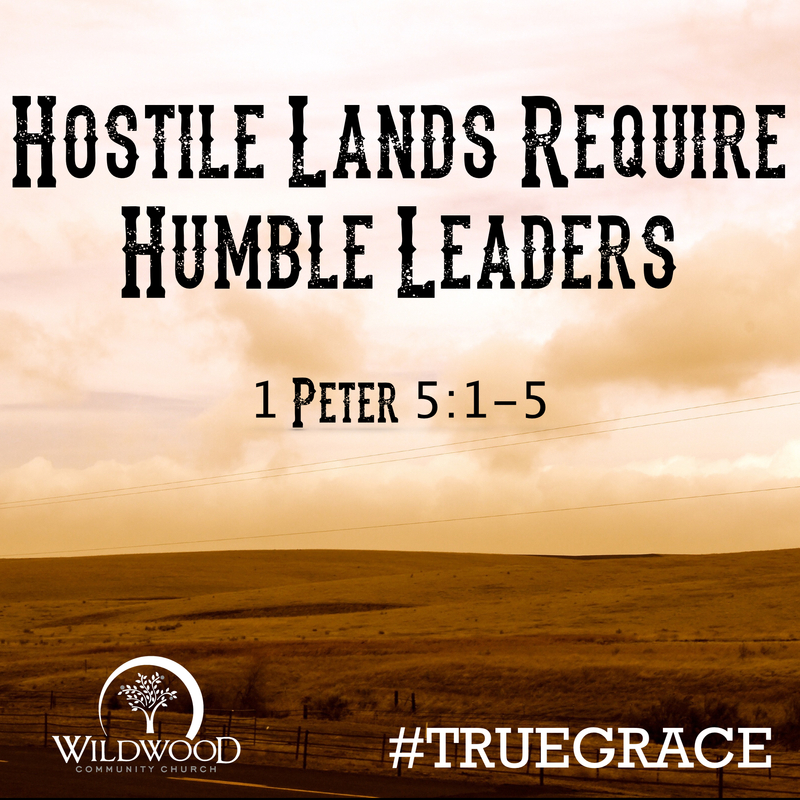 This past Sunday, on August 9, 2015 at Wildwood Community Church, I preached a message based out of 1 Peter 5:6-11. This message was part 10 in the “True Grace” sermon series. The audio and video of this message are posted below. 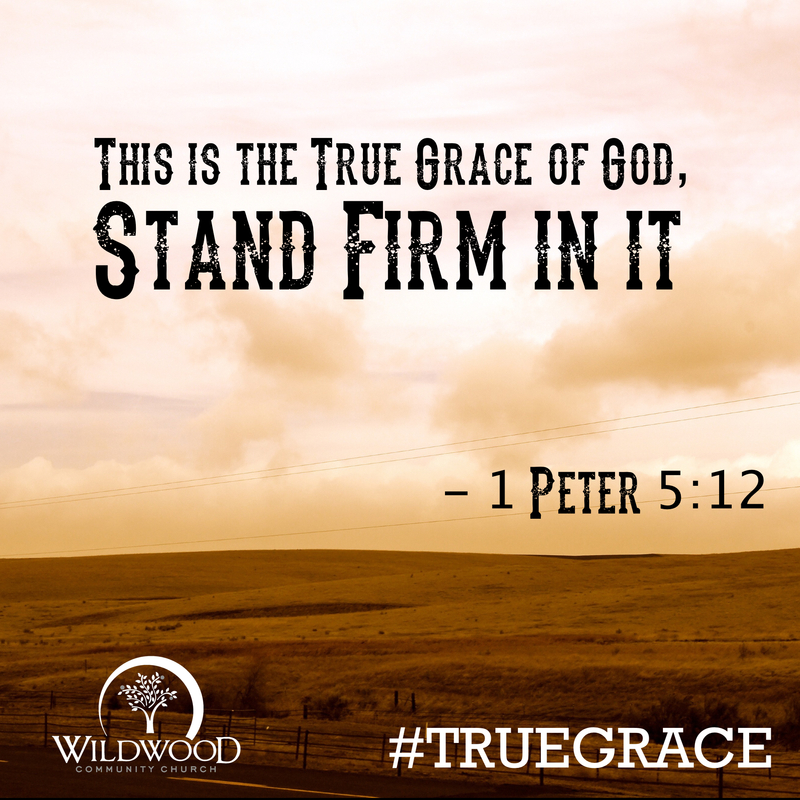 To access the entire “True Grace” study, click here. I have a problem with my driveway. It wants to grow grass. All spring and summer, I can plant seeds, water, and fertilize my yard . . . and see no new grass grow. However, zipping back and forth across my driveway are shoots of green reaching for the sky. To be fair, however, I must note that grass does not grow everywhere on my driveway, only in the cracks. This makes sense, doesn’t it? The concrete is too dense to allow anything up or down in most spots. Only where pressure and weakness have created a fissure can the unwanted grass make its way up. Only a squirt of Roundup can destroy these saplings. I was thinking about that as I read 1 Peter 5:8-11. In these verses Peter warns Christians about Satan who is roaring about like a lion seeking to devour his prey. At first glance this section seems like a random conclusion to the letter. However, a second read reveals that the inclusion of these verses is very strategic and relevant to Peter’s argument. As we have seen, the book of 1 Peter is about the grace God gives to Christians, allowing them to stand firm while they are living in the hostile environment of this world. Indeed, Christians were being persecuted and maligned for their faith, along with a number of other fiery trials. Life was hard. As Peter concluded his letter, he wanted Christians to realize that Satan wants to take advantage of these hard times to try to make Christians waver in their faith. In a sense, Satan knows that in good times, our faith may remain as strong as concrete. However, Satan is waiting for the pressures of this life, persecution, and our own weaknesses to create fissures where his lies and temptations can take root and tear us down. Like grass peaking through my driveway, Satan wants his misery to overcome our firm foundation. Have you ever seen this to be true in your life? I have felt it in mine. When things are good, we easily say God is good, but when life falls apart, we wonder if God cares at all. Too often we fail to call these doubts what they are: Satanic attacks. The devil is prowling around, waiting for life to wear us down, then he wants to pounce on our depression. “Be sober-minded”: Do not get drunk on your emotions and allow them to destroy what you know is true about God. “Be watchful”: Know the triggers in your life of times/seasons where you are tempted to doubt God. Satan wants to trick you in these times. Be on guard in your times of weakness. “Resist him”: No offensive attack is necessary here . . . Jesus has already won the battle. Simply stand firm in the victory Jesus has already won. Don’t give in to his lies. “Firm in your faith”: Maintain strong conviction in truths of Scripture. “Knowing that the same kind of suffering are being experienced by your brotherhood throughout the world”: Isn’t it amazing how quickly we can play the “poor me” game. When difficulty comes we quickly think we have it worse than others. Though the particulars of our suffering are unique, difficulty is as universal as the sun. We don’t have to hide our struggles, they allow us to be a part of the “club” called Christianity. “As you have suffered for a little while”: Remember that the trials we go through are for a short time compared to eternity. “The God of all grace . . . will restore”: Our hope against Satan is found in our God who will give us the grace to stand now and will glorify us in the future! “To Him be the dominion forever and ever”: We are living in Jesus’ Kingdom. We know he has overcome Satan and we can share in His victory. As we live out our life in Christ, let us not allow Satan to exploit the cracks in our concrete to sprout forth his lies. Follow the exhortation of Peter and allow Jesus to round up the devil’s darts before they take root. Join us this Sunday, August 9, 2015 at Wildwood Community Church in our 9:30 or 10:50 worship services as I preach a message based on 1 Peter 5:6-11. STUDY NOTE: Silvanus is the Roman form of the name “Silas.” This Silas could have been the Silas who was Paul’s companion in the book of Acts or another Christian by the same name. While it is possible that Silvanus served as the secretary who wrote down Peter’s words for this letter, it is also even more probable that Silvanus helped deliver this letter to the Christians of Asia Minor. In a day before UPS, the Postal Service, or FedEx, letters were hand delivered. Peter wrote this letter to share the “true grace of God” that they would “stand firm in it.” In what ways does 1 Peter reveal the grace of God to Christians who are suffering or experiencing various trials? How does the true grace of God (as Peter describes it) allow Christians to stand firm in the face of persecution and trials? STUDY NOTE: In 5:13, Peter sends personal greetings from two others: “she who is at Babylon” and “Mark.” Mark is a reference to Peter’s longtime friend and ministry colleague John Mark, who also wrote the Gospel of Mark. However, scholars differ in their understanding of who “she” is. Some have seen this as Peter’s wife. However, it is altogether possible that “she” is a reference to the church that Peter was fellowshipping with when he wrote this letter. Tradition puts Peter in Rome as he wrote this letter, and Babylon (with its Pagan tendencies) was a common idiom for Rome among early Jew and Christian followers in the first century. It is totally possible (even probable) that Peter lets the battered believers in Asia Minor a hint that there is a thriving church in the Roman capital, right under the nose of the Emperor who had set as his mission to devour the church! Our God will not be defeated! Peter ends his letter in 5:14 by reminding his readers to be loving (the kiss was a common way of publicly showing affection between family members in the first century) and have peace. As Warren Wiersbe says of this conclusion, “What a wonderful way to end a letter that announced the coming of a fiery trial!” In what ways is 5:14 a fitting conclusion to this letter? What is one major takeaway you have from your study of 1 Peter? Though Christians suffer, their suffering will not last forever. Peter here says that our suffering will last for only a “little while.” However, all of us can think of people whose suffering has lasted for what seems like a long time. In what way is it true that Christians only suffer for a “little while”? The hope Christians have in the midst of suffering is not just for a short duration of trouble, but also for their God who will come to their defense. In 5:10, Peter calls Him the “God of all grace.” What stands out to you most about this description? Peter uses a variety of phrases in 5:10 that all make the same point: our gracious God will take care of us. Think of the last time you had a significant time of suffering/struggle in your life. How does this verse encourage you in your time of trouble? After talking about all that God has done (and will do) for us, Peter breaks into a short doxology (time of praise) in 5:11. Take a moment and write your own doxology expressing your thankfulness to God for what He has shown you in your study of 1 Peter. Not only are Christians to be humble with one another (5:5), but they are ultimately to be humble under the “mighty hand of God” (5:6). The idea of the “mighty hand of God” is an Old Testament idiom that can be used of both God’s judgment and His deliverance. In context here, it seems that Peter wanted to remind Christians that the circumstances of their lives (good and bad) were overseen by their God. Does God’s sovereign authority over your life provide encouragement for you? Why or why not? In 5:6-7, Peter gives a few reasons why we should trust God with our lives. What are some of the reasons Peter lists here? What are some of the things that produce anxiety in your life? What does it look like to “cast” those anxieties on God? Being “sober-minded” is similar to being self-controlled or disciplined. Peter encourages believers to be disciplined and watchful for what reason in 5:8-9? If you were to summarize Peter’s command to Christians regarding Satan in 5:8-9, what would you say? Given the context of the entire letter of 1 Peter, why do you think Peter turns to talking about Satan and his strategies at the end of this letter? In what way can Christians be “devoured” by Satan? How can you apply the principles this passage teaches about resisting Satan in your life today? To access the entire “True Grace” Study click here. On Sunday, August 2, 2015, I preached a message at Wildwood Community Church based out of 1 Peter 5:1-5. This message was part 9 in the “True Grace” sermon series. The audio and video of the message are posted below for you to listen to, watch, or share. On Sunday, August 2, 2015 I preached a message at Wildwood Community Church that was based on 1 Peter 5:1-5. This message was part 9 in the “True Grace” series. Below are a set of questions for personal reflection or group discussion related to this sermon. I opened this message by saying that good leadership is especially important when times are tough. Can you think of any examples from history or from your life where this principle holds true? In a world where Christians are being persecuted, part of the grace Jesus gives to His church is through humble human leaders. In what way have you seen humble leaders be a blessing to churches you have been a part of ? In 5:1-4, we see several things about elders in local churches. One thing we see is that there is a plurality of elders (i.e. the church is not led simply by one person). What is the value of a multiplicity of leaders who are “among” the people they lead? The main job of an elder is to shepherd (or Pastor) through providing oversight. What do you think this practically means? Peter also gives a set of admonishments of what leaders are to do and not do. Specifically, he warns Elders from being reluctant, greedy, lazy, or domineering. Any leadership in a church that looks this way is NOT what Jesus prescribed. If you are in leadership in any ministry, how can you apply these verses to your life today? Jesus is also shown as the rewarder of the Elders of the church . . . ultimately at His second coming. John Calvin rightly said, “To prevent the faithful servant of Christ from being cast down, there is this one and only remedy, to turn his eyes to the coming of Christ.” In what way does waiting on Jesus to reward you free you up to serve today (regardless of circumstances)? Humility is not just something for church leaders, but something that both leaders and members must aspire to. I made the statement in this message that the best test of humility is shown NOT when you act like a servant, but when you are treated like one. In what way do you think humility shows forth when you are mistreated or under-appreciated? What are the main takeaways you had from today’s message? Adolescence. We have all been through it. You know, the time when you have lived through nothing but know everything? The time when you have more pimples than purpose? The time when you have more recreation than responsibility? The time when your parents were clueless and your peers were crafty? Yeah, you know the time. We all lived through it. In fact, I think we have all lived through it twice. Twice? Are you serious? What kind of a cruel joke would it be to make someone relive 13-16 again? I mean seriously . . . there are many moments from those years I wish I could just cover with white out and move on. Why would anyone want to live through those years again? When I say we have lived through adolescence twice, I do not mean that we have grown up physically twice . . . but I do mean that as “born again” Christians, we have gone through a second “spiritual adolescence” at some point in our spiritual life. Spiritual adolescence. We have all been through it. You know, the time when you lived through very little spiritually speaking, but know everything? The time when you have more opinions than wisdom? The time when those who walked with God for many years have “lost their fire” (in your estimation) while your campus group is the only one who is “doing the Christian life right?” Yeah, you know the time. If we are honest and self-aware enough, most of us have gone through a phase of our Christian life where we thought we knew it all. In 1995 that was me. Today, 20 years later, I am amazed at what I do not know. God, the Christian life, and ministry are simply too big to be totally figured out on a weekend retreat. It takes a moment for someone to become a Christian, but it takes time and experience to go from a spiritual babe to a man or woman of God. I was thinking about that as I read 1 Peter 5:5. Peter encourages all young people in these verses to “be submissive to those who are older.” What is Peter getting at here? Is he indicating that old people are more righteous than young people? No, in Christ all are declared righteous and totally forgiven of their sins. Is he indicating that old people are more valuable? No, Jesus died for all people . . . no one is more valuable than anyone else. Peter writes to the early church and encourages its younger members to be submissive to its older members because there is wisdom with age. This wisdom cannot be learned through reading books alone, it is learned on the pages of real life. Walking with God while living life creates a depth of character, wisdom, and insight that cannot be microwaved. Because of this truth, Peter wants young people to submit to those who are further along than them because they have wisdom that young people need. Like a teenager who learns how wise their parents were (after he turns 26), so “adolescent” believers learn how wise their elders are after they have weathered a few storms of their own. I am writing this letter today as someone who sits squarely between two worlds. Around many in the church, I am the young guy . . . a nearly 42 year old dude who has yet to figure a lot of stuff out. Around youth and college students (much to my chagrin) I am becoming one of the old guys . . . having lived through enough decades to have a different perspective than just a twitter account and a facebook page. Being in this place gives me reason to apply this passage in two directions. If you are a “young person” be careful to not fall into the trap that “you are the only one doing it right.” Clothe yourself with humility and listen to the perspective of those further along than you. If you are an “elder,” live a life that is worthy of respect. Don’t just place your life in cruise control and coast into apathy. Continue to walk with God and trust Him on a daily basis. Be willing to share your life experience with younger men and women so that they can learn from the wisdom God has taught you over years of living. Let’s all age well in the Lord together. After all adolescence is hard to go through . . . both times. Join us this Sunday at 9:30 or 10:50 at Wildwood Community Church were I will be preaching on 1 Peter 5:1-5. STUDY NOTE: While not all “Elders” were necessarily older than the other members of the congregation, often-times they were . . . and always they were mature in their faith. Therefore, it is very appropriate for Peter to refer to the congregation as “you who are younger” in contrast with the Elders. What does it look like for members of a congregation to “subject themselves to the elders” (5:5)? Do you notice a consistency of behavior of the Christian to authorities (see 1 Peter 2-5)? What does this tell you about the effect a mature Christian should have on the groups they belong to and the society they live in? Peter calls on the Christians to “clothe themselves with humility toward one another.” Literally, this has the idea of “having others see your humility as you live your life,” just like someone sees the clothes that you wear. Would those around you consider your general attitude one of humility? If not, what are some things that need to change as you “clothe yourself in humility”? Though this week’s verses (5:1-5) talked primarily about Christian leadership, the idea is that the values that the leaders modeled would be a part of EVERY mature Christian’s life. What primary applications stood out to you from this passage this week?